This project is successfully founded on KickStarter! Check our also the MickMake and EEVblog reviews of this project! This is the upgraded version of our original project: I2C Encoder. We have added some new improvements. Most importants are the support of the RGB encoders, the extension of the addressing to 7bit and a new shape. After the first version of the I2C encoder, we collected all the suggestions and we made this new upgraded version! This new version is powered by the PIC16F18344. Respect to the MCU on the first version, it has more GPIO and the EEPROM memory. 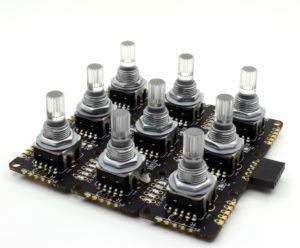 The new design of the board support both the standard encoders and the illuminated RGB encoders. Moreover, there are the castellated holes on all the 4 sides of the PC, in this way will be possible to connect multiple board by soldering them. 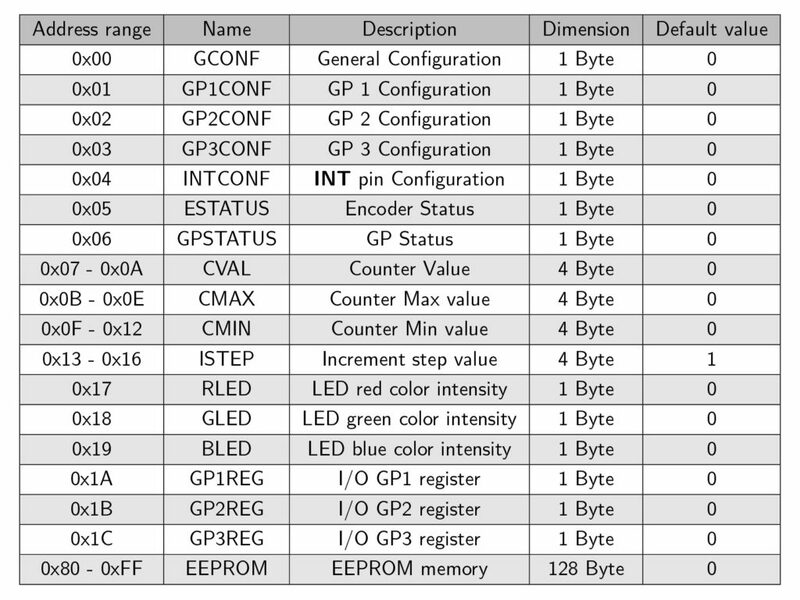 There are also 3 configurable GPIOs organized with the same footprint of a RGB LED. They are called GP1 GP2 and GP3. 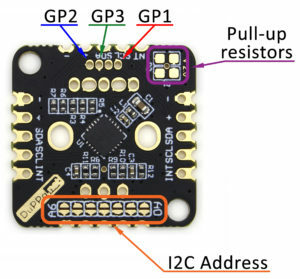 But in case you are using the RGB encoder, the configurable GPIOs are only 2: GP1 and GP2. OUTPUT: You can use the pins as standard digital output. The INT pin is an open-drain output, and it’s used to send an interrupt to the master. The interrupt is active low, and have multiple sources where it’s possible to mask. Now it is possible to configure the Counters register to work as int 32bit or as float numbers IEEE 754. There is also the possibility to set the Increment step, which meas that it’s possible to set of how much the Counter Value is increased or decreased at every encoder step. 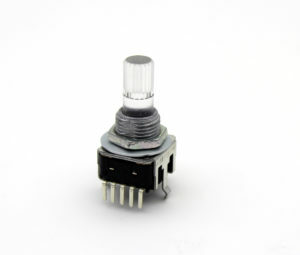 This is a mechanical encoder with an integrated RGB LED and a transparent shaft. It’s possible to control the RGB LED that makes the shaft illuminated. 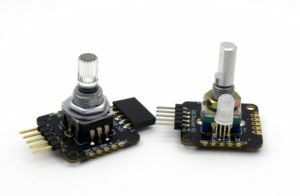 With the transparent knob, it’s possible to use the rotary encoder and see the light coming from the RGB LED. The encoder comes with nut and the washer. 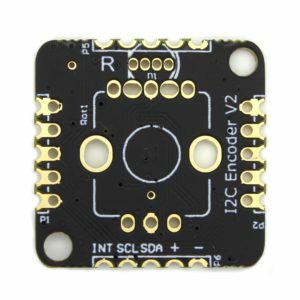 This RGB encoder is available in our Tindie store, you can purchase it seperately from I2C Encoder V2 or add it as “Accessory to be soldered” when you order I2C Encoder V2. 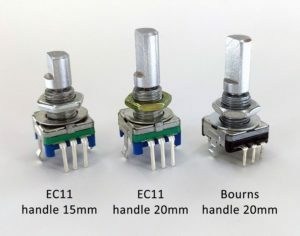 There are two types of knobs for the RGB Encoder. 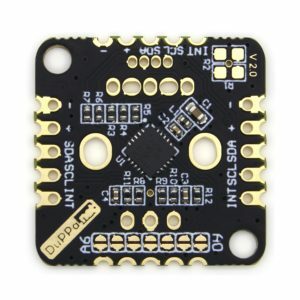 You can purchase them together with I2C Encoder V2 as “Accessory to be soldered”. Check our firmware updates and more examples on Github. For more details, please visit our hackaday page here.